The kit includes a handy visitor log book with a visitor protocol and procedure plus 26 eco-friendly badges and clips. Badges consist of three types formatted for maximum effectiveness and control. Included is the ITAR Visitor Log Book which ensures smooth and professional check-in of all visitors as well as six (6) ITAR Signs (one of each popular type) including a large 18 x 12″ aluminum sign. The kit is enough to stock one lobby area and to place signs around your company for your ITAR Security Program. The ITAR Sign Diamond Bundle includes everything that you need to enable convenient record-keeping of visitors to offices or any facility. Visitor identification with an ITAR Badge is a vital part of today’s corporate world. Visitor ITAR badges are crucial when it comes to creating a modern secure environment. ITAR and Export compliance requires that you post ITAR Signs in and around your facility. Whether it concerns commercial, government or public institution, proper identification of visitors streamlines day to day business processing and efficiency of the entire organization while protecting you from a serious ITAR Violation. This ITAR Sign Diamond Bundle equips you to track your visitors’ record easily and post signs at your facility. It includes a handy ready to use ITAR Visitor Log Book, 26 ITAR Badges for your visitors and a Visitor Protocol for your company. These ITAR Badges are made from 99% PVC and are fully biodegradable; leaving no damaging toxins behind. A great solution for health- and earth-conscious organizations! 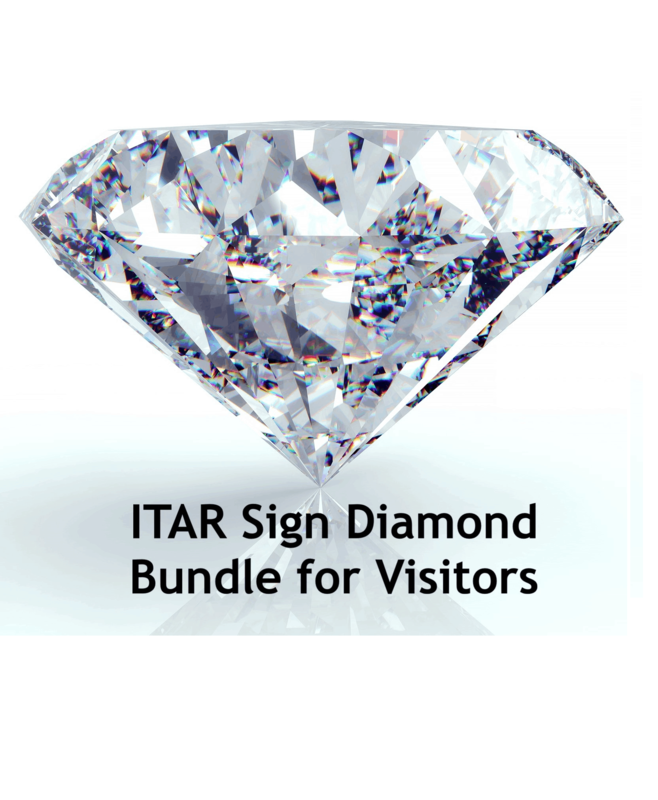 As a bonus, this ITAR Sign Diamond Bundle includes one each (6 total) of the most popular CVG Strategy ITAR Signs. Have questions about earth-friendly ITAR Badges? We have answers! Why is an earth friendly ITAR Sign Diamond Bundle for Visitors a good choice? Protect you and your employees from a possible ITAR Violation during customer and vendor visits. ITAR Compliance is a serious program important to every US Company. While you protect your company, take a step toward protecting our planet with our bioPVC ITAR Badges. They maintain their integrity under normal, everyday use; they can get wet, be left on a shelf, left in a wallet, printed on, vacuum-formed, cut, embossed, and UV treated without breaking down. Biodegradation takes place only when the cards are in a fertile environment in which microorganisms are present. This ITAR Sign Diamond Bundle includes a Visitor Protocol and Sign-In Register is made from biodegradable paper which is from recycled stock, all green products from CVG Strategy!